PaperCut NG is a print and internet quota, charging, tracking and monitoring system designed to promote the responsible use of IT resources. It's a premium cross-platform solution specifically designed to meet the needs of schools, universities and other organizations. Implementations range from silent monitoring, quota control to user-pays systems.Full support for multiple print servers and monitoring of local desktop printers. Qweas is providing links to PaperCut NG for Linux 10 as a courtesy, and makes no representations regarding PaperCut NG for Linux or any other applications or any information related thereto. Any questions, complaints or claims regarding this application PaperCut NG for Linux 10 must be directed to the appropriate software vendor. 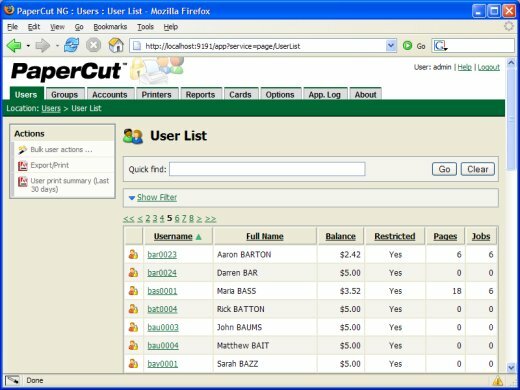 You may click the publisher link of PaperCut NG for Linux on the top of this page to get more details about the vendor.